Otherwise known as FO #93. I had a skein of Pastaza in my stash that I didn’t know what to do with, and I’d toyed with knitting hats to send to this program in the fall. 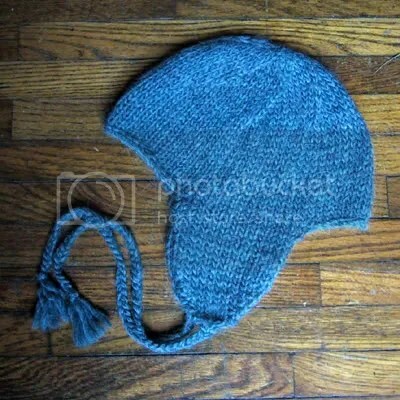 I relied heavily on this pattern when I started knitting earflap hats, but I changed up a few things and rarely use a pattern any more….but I wrote this one down as I knit it up. 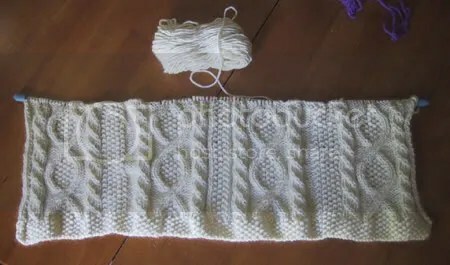 Knit straight until piece measures 3.5″. 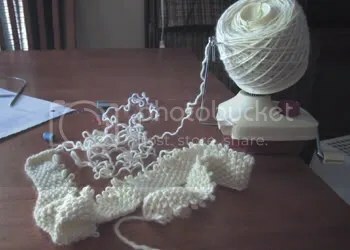 Using a cable cast on, CO 10 stitches on the circular needle. Knit the 15 stitches from first ear flap, then CO 24 stitches. K15 from second ear flap, then CO 10. Join, being careful not to twist stitches, place marker and begin knitting in the round. As you knit around this first row, you’ll notice four gaps, on either side of each ear flap. When you get to those, K2tog to close them up. 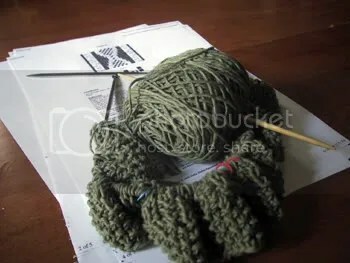 At the end of the round, you should have 70 stitches on the needles. They’re pretty much cleaned out now I’m guessing, but KnitPicks is having the sale of a lifetime (50% off all non-KnitPicks needles) and this morning I got a set of Denise interchangeables for $28 shipped!!! Absolutely unheard of!! The Addis were sooo tempting too, but I restrained myself….. I was shooting for blues and greens, and I swear I tested all the colors and that dark-blue-lookin’ dye came out looking blue. But wait, then it turned purple…. 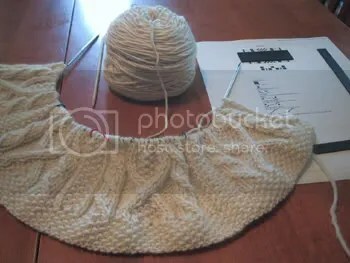 Lisa P. correctly spotted the heinous error…she did have two advantages — having knit Trellis herself (a silver medal KO project, very nice), and having me ten feet from her desk telling her if she was right or wrong. 😉 Soooo…her prize will only be sort of special. Hee. So, the error was that, in my zeal to follow the pink letters in the pattern (ensuring you are working edge stitches in reverse stockinette!) I inadvertently switched the left and right fronts. 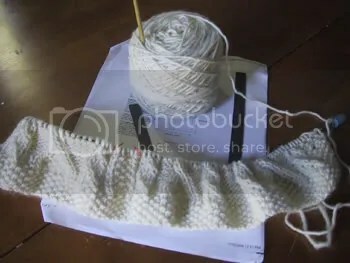 Silly wabbit, when you’re working it as one piece, there are no reverse stockinette edge stitches. Only button bands. Worked in seed stitch. Which, in my work, were next to the side “seams” instead. Oops. I’m telling you, knitting Darwin Award, right here. I charted it out and tried to figure out if I could salvage it by adding button bands after the fact and dinking with the neck shaping, but you know, it was a little hairy and it would have bugged me forever. So…. Around dinnertime yesterday, less than 48 hours from when I started it, I bound off for the sleeves of my Trellis. That’s two and a half pattern repeats — 51 rows — 6,681 stitches — so far. I was sooo proud of myself. Ha. Then I noticed the mistake. It’s a really, really big one. I’m not going to go into the details here, because I feel like an idiot. It was one of those things where the whole time I was knitting, I thought, “hmmm, that’s a little odd.” But it wasn’t until I stopped and took a good look at it that I realized what I had done. We’re talking, if there were Darwin Awards for knitters, I’d be in the running. To the untrained eye, not a huge deal. To me…well, I think I might be able to alter the pattern a bit to accommodate my glaring error. But I’m not sure that it wouldn’t drive me completely crazy. I *so* should have waited for Jenny’s spreadsheet. Sooo…frog 5,563 stitches? Or keep going? Ack. On second thought, I’ll post a picture and the first person to identify the horrifying error will win a special prize!! I frogged the green. And wound my three skeins of natural 100purewool with my brand-spankin’-new swift. A much better choice!! I love love love knitting with this yarn. No more swearing. It was totally the yarn, not the pattern. I had intended to dye this yarn, but it’s just perfect for this sweater. It’s every bit as scrumptious as Malabrigo, but a little bit lighter weight. If I could afford to buy enough to justify the shipping cost, I’d defenitely have a storage problem. I’m crossing my fingers for another co-op…. …turning into my mother, it’s not even funny. I thought this as I sat next to the window this afternoon (kids in the pool, don’t you know), swearing like a sailor as I tinked more than I have in eons while working on Trellis. (My mother could knit any aran sweater on the planet. And love it and hate it at the same time.) It’s frustrating — getting used to the charts, adjusting the pattern on the fly, cursing my yarn choice — yet as soon as I stopped, I wanted more. To clarify, it was not my hard drive that died. I’m part of a tech support team and we’ve had two user hard drives flat out die with no warning in the past week, something I can only remember happening one other time in the past 10 years. I think that tonight, I shall listen to God’s gentle prompting and back up everything on my hard drive. So, busy work week. Hard drives, firewalls, blah, blah, blah. You know what that means…extra money! 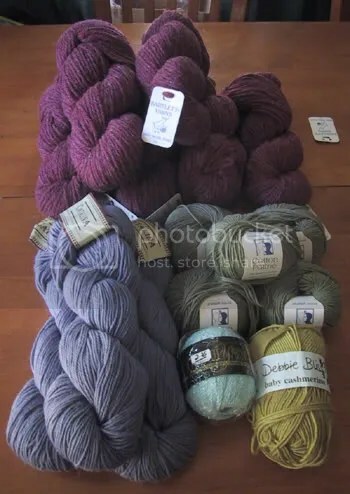 How could I resist spending a portion of my kidless afternoon at the LYS that’s having a 40% CLOUSEOUT SALE on all Karabella, Elsebeth Lavold, and Catalina yarns?? ?